random thoughts of an aging artist: Jewelry and "Grace Notes"
Yesterday I was talking about a piece I had submitted for publication. Since there seemed to be some interest in seeing what it was, I've included a link here so you can go and check it out on my other blog. Meantime, just a preview, here are pictures of the three newest pieces I have completed. Yesterday a new column appeared in our local paper entitled Grace Notes. Nicely written, and she takes on some subjects that I've been talking about here. In her column she says: "I believe language is powerful, especially poetry, that words can be weapons or gifts, that healing is always possible, and that we are each more holy and worthy than we think." 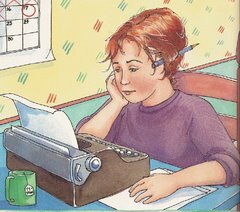 If you'd like to take a look at the whole column (and some of her earlier work too), this link will take you to her column. Its a pleasure to see some POSITVE thought in a newspaper among all the reports of murder and war. These are gorgeous pieces. 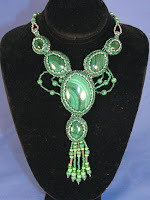 I love the malachite necklace!